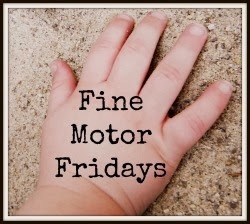 I'm so excited to be teaming up with the lovely ladies of Craftulate, Lalymom, School Time Snippets, and Stir the Wonder for Fine Motor Fridays, a new series where we will be sharing fine motor activities for toddlers and preschoolers every Friday for the month of October. I love incorporating music into various activities, so I decided to do a musical spin on one of J's favorite activities lately: cutting with scissors. So not only did J practice his scissor skills, but he learned about music while he cut away. Okay, so I know the title of this post says cutting tray. As you can see in the picture above, I didn't use a tray at all. I just didn't know what else to call it. Therefore, the real title of this post is, "Music Themed Strips of Paper Laying on My Not-So-Clean Carpet Cutting Practice Activity." Whew, that's long winded! Get on with the activity already, right? Okay, up first is the grand staff cutting sheet. I drew green dotted lines to show where I wanted J to cut. J had the chance to practice making long cuts by cutting the grand staff into separate lines of music. While cutting, I reinforced the music terminology by explaining that he was cutting strips with the grand staff on it. You can easily find blank grand staff paper just by doing a simple Google search. I, on the other hand, found this in the back of one of my harmony books in my piano studio. And I only came across this book from way back yonder because K knocked my old piano bench over (and broke the lid off in the process). Turns out, there was a gold mine of my old theory texts and workbooks in there. J spent the most time on these musical notation strips. I cut cardstock into 1 inch strips and drew various music symbols on each strip using a permanent marker. I drew half notes, eight notes, sharps, naturals, treble clefs, and bass clefs. However, you could include rests, repeat signs, dynamics markings, or really anything you'd like. J's task was to cut the strips so that only one symbol would remain on each piece. He loved this activity because he would also count. Again, I reinforced the music terminology as he cut the paper, which eventually lead to him saying, "1 half note, 2 half notes, 3 half notes, etc." Here's some of J's cutting results. The third part was to cut along the bar lines to divide the music up into measures. You can find tons of sheet music for free to print off, but the song I used was a leftover Christmas song from Making Music Fun that I found in my piano studio. Again, I reinforced the terms "bar lines" and "measures" while J cut. He wasn't as enthusiastic about this part, but still did a pretty good job. There you have it. A new twist on developing those fine motor scissor skills! Thanks, Laura! I do love adding a musical element to lots of our activities. LOL over your post's "real" title! This is such a cool idea - I can't wait for my son to get to the scissor stage! Hahaha...yes, the real title is much more realistic and awesome! K is totally into scissors already and he just turned two. He's slowly getting better at it, but usually just uses the scissors to rip the paper instead of cut it. My 2 year old (30 mos) is just getting into scissors now-- such a great activity and love the musical element! This is great! My daughter needs to work on her music theory, and I think she would like this activity, even if she doesn't need help with the scissor skills. (She's 8.) I could get her to turn the pieces she cuts up into a music collage. Thank you for sharing! A collage would be a fantastic idea! I am absolutely doing this! I'm a non-musical mama and really want to help my children learn and appreciate music. This is so great! Thank you!! You're welcome! I am always happy to share my love of music with others, especially those who are non-musical. 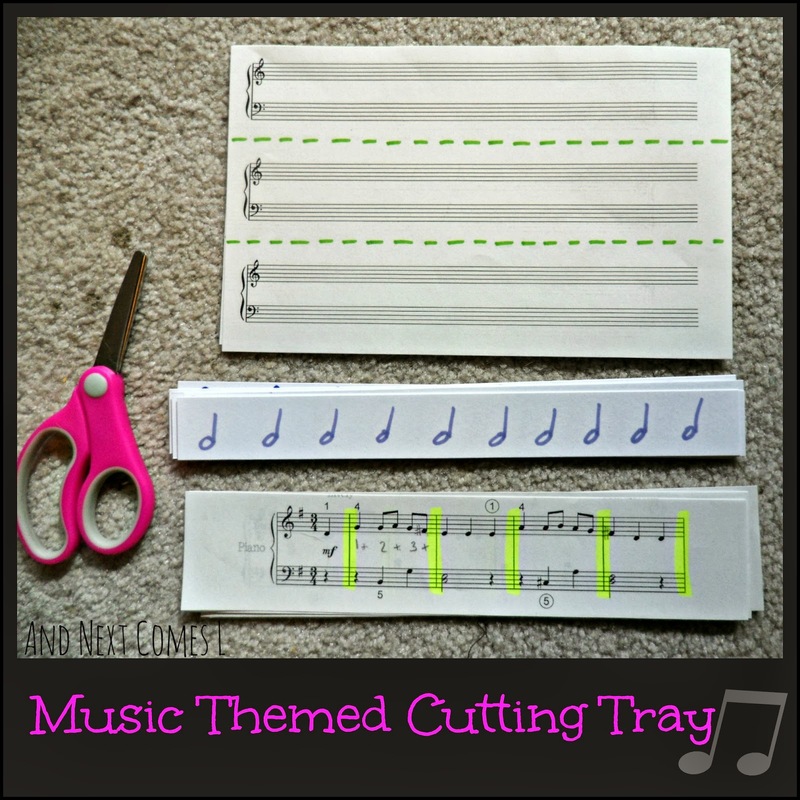 What a wonderful way to introduce sheet music and work on cutting skills! What a fun idea! 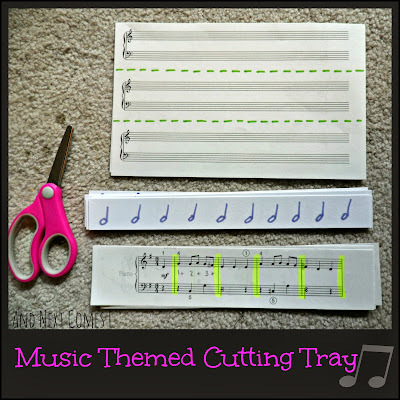 I've been working on coming up with activity trays for our 5 sense unit next week and this music cutting tray will be a great addition! Thanks! I'll be sure to link back pictures from my blog when my students get to it next week! I would love to see your post when it's done! And I am glad I could help you out by giving you some inspiration.